May 17: A zero day at least! Usually I take zero days with Amanda and we explore the countryside, but so far on this visit, she’s only slackpacked me through the Shenandoahs. Which, somewhat ironically, is a terrible place to slackpack because as a whole, it’s a fairly easy section of trail to walk. But the weather forecast for today was less than great and today I’d finally get a zero. And Amanda’s idea for exploring the countryside included a visit to Luray Cavern. It meant a little backtracking for us since I’d already passed Luray on the trail. We had even spent a night in town! The formations in Luray Cavern were great! I still wanted to do the high level and stayed up there. Amanda did the easier level that was also lower and finished up quickly. I did every part of the course at least once, though, because it was fun! And heights didn’t bother me. Not as long as I knew I was roped up and it was impossible for me to fall. After I got down, then we headed next door and hit the life-size maze. It’s like a corn maze, except it wasn’t made out of corn. =) It had four checkpoints in the maze we had to hit, but by the time we reached the exit, we’d only gotten three of them. Amanda had enough of that and went out the exit. I headed back into the maze to continue looking for the last checkpoint. Eventually I found it and worked my way back out the maze again. And finally, next to that was a historical museum so we went into that to explore. There was even a blacksmith shop with an older gentlemen working it and explaining how it all worked. This organ was hooked up to the stalactites so each note on the organ would “buzz” the necessary rock formation to play music. It’s an intriguing concept, but I have to say, I hated it. Seeing wires running around the cave formations and all of the broken formations setting this up caused—it’s a travesty. I can’t imagine something like this would have been approved in this day and age, but our early ancestors weren’t as sensitive towards these priceless formations. Amanda took one look at this section of the ropes course three stories high and immediately turned around. I kept going, though! Amanda tries to decide which way to go in the maze. Left, or right? A mural on the wall in the historical museum. The blacksmith works on a small piece. Day 70: Out of the Shenandoahs! May 16: I got another early start to the day’s hike, partly due to the fact that rain was expected later that afternoon. No sense getting a late start and getting caught in rain! Amanda dropped me off at Compton Gap which left me a short 5.6 miles to US 522, where the trail crossed the road a few miles from Front Royal. The hike was uneventful, but when I arrived at the highway, Amanda was nowhere to be seen. She showed up about 20 minutes late explaining that she had driven to Winchester to go to a Fed-Ex office which hadn’t opened as early as she expected. No big deal, although I was a little disappointed to have missed Winchester myself. Maybe next time! We ate lunch at a diner, and later ate dinner at a luner. (That’s a joke. Please don’t tell me that there’s no such thing as a luner!) We did really eat lunch at a diner, but we ate dinner at a soul food restaurant downtown. Getting downtown turned out to be more difficult than we expected because there was a wine festival going on that closed down all sorts of roads and left piles of people—many clearly inebriated—littering the streets. But it didn’t stop us from finding a place for dinner! Outside of leaving the hotel for food, though, I stayed indoors just working on blog entries. I needed to get a bunch of these suckers done! Day 69: Bears! Bears! BEARS! May 15: Since Amanda came out to slackpack me, I got my earliest start on the trail to date: 8:00 AM! Part of it was due to the short, quick drive from the hotel in Luray to the trailhead at Thornton Gap, but it helped that I ate breakfast right in the hotel room that was nothing more complex than a bowl of cereal. This would only be the first bear sighting of the day! In any case, I got an early start to the date and felt like it was a good start to the day! Sunny and warm, no less! I caught up with Happy early in the morning and we chatted for the better part of an hour before I peeled off to go to a shelter a bit off trail. Later in the day, I crossed paths with Beaker and Bostrich again—they seemed to be stalking me! I was seeing them on a near daily basis now. And late in the day for the last hour or two, I hiked with Beaker and Kilroy. Well, maybe Kilroy. I wrote in my journal “(I think? )” next to his name, so clearly I wasn’t 100% confident about his name. =) He was a new face to me. Originally I intended to stop at a certain point where the A.T. crossed Skyline Drive that my guidebook showed a parking lot nearby. Amanda was there with cold drinks and Beaker stopped long enough to partake of one before moving on. I was going to quit, but Amanda pointed out the next road crossing also had parking—a fact not mentioned in my AWOL book—and the weather was still looking good. We also planned to move hotels further north on the trail to Front Royal as well, so Amanda talked me into hiking a few more miles to the next road crossing. It would put us closer to Front Royal so I’d have a shorter drive into town, and a shorter drive for both of us back to the trailhead the next day. So I got back on the trail and quickly caught up with Beaker again and we fell into hiking together the rest of the way. She was planning to move to Seattle in about a month after she finished her hike (she was stopping in Harper’s Ferry and her finish date was only about a week away). So we talked about Seattle a lot. What to see and do, hiking trails in the area, the Wonderland Trail and even gave her a copy of my Washington Trails Magazine that I had been carrying when Amanda brought it. Speaking of which, it’s not to late to sponsor me for the WTA’s annual Hike-a-Thon! If donating towards a worthy cause isn’t reason enough to do so, I’ll be sending a postcard from somewhere in Europe as a thank you to anyone who contributes at least $10 to the cause! =) Be sure to email me your address in case I don’t have a record of it already, though. But I digress… At one point, Beaker and I reached a trail junction at the top of Compton Peak and found ourselves stumped about which direction to go. We knew which way the trail went, but signs marked a viewpoint 0.2 miles to the east and another viewpoint 0.2 miles to the west. We were both interested in seeing a viewpoint, but neither of us felt like hiking 0.2 miles off trail twice to see two different viewpoints. Which one should we try? The signage had no hints about which might be the more interesting of the two. It just said “view.” In both directions. I finally came up with a clever way of making a decision: We flipped a coin. I flipped it, and Beaker called out tails. I missed the catch and the coin hit the ground coming up tails, so we headed west. We admired the view—pretty much what we expected to find—then continued north on the Appalachian Trail eventually reaching Compton Gap and where Amanda picked me up for the day. Beaker continued onwards. Signage at the trailhead described the two viewpoints at Compton Peak and I was a little disappointed to find out the other “viewpoint” had led to a bunch of columns like you’d find at Devil’s Postpile. It wasn’t a “view” so much as it was an interesting geological feature, and I was a little bummed we hadn’t gone in that direction. I’d been seeing views all over the place. Geological features like this were much more rare, however. And why didn’t they have signage about the viewpoints in the direction we had come so we could have made an informed decision?! Anyhow, I hopped into the car and we started the long-ish drive to Front Royal when, a few miles away, we saw a bear on the side of the road enter the trees on our right. Bear! Bear! The trees were too dark and the sighting too fast to get a photo which bummed me, and as we drove past, I noticed a smaller baby bear peeking out of woods as mama bear was entering it. Baby bear! Baby bear! Cute as a button! But again, it was too dark and too fast for me to get a photo. Amanda missed the baby bear completely. The cub still stalled, not wanting to jump off the wall, and the mama pushed it a bit with her snout. It was soooo adorable! Eventually she got the cub down the other side and the three of them disappeared down the slope for good. We made it into Front Royal without anymore bear sightings and checked into the local Super 8, then ate dinner across the street at Spelunkers. Spelunkers, according to online sources Amanda looked up, is the best food in town. I was a little surprised at this because it was basically just your typical fast-food establishment. Not a chain (so far as I know), and the food was fine, but I’m not sure what all the fuss over it was. Nothing extraordinary! Kilroy (maybe?) is on the trail! I flip a coin to determine which of two viewpoints we should check out. I will readily admit, however, that this photo is a mostly-accurate recreation of the actual flip. The actual flip I missed catching and it hit the ground. =) Other than that detail, though, this is exactly what it looked like! Beaker is hiking! Beaker is hiking! The first bear sighting was fast and with the darkening skies, this was the best photo I got. The cub in the woods I didn’t get a photo at all. You can practically see the frustration in the mama’s face. I'm going to interrupt your regularly scheduled Appalachian Trail posts to remind y'all--it's that time of year again where Amanda and I try to raise a little money for the Washington Trails Association during their annual Hike-a-Thon! 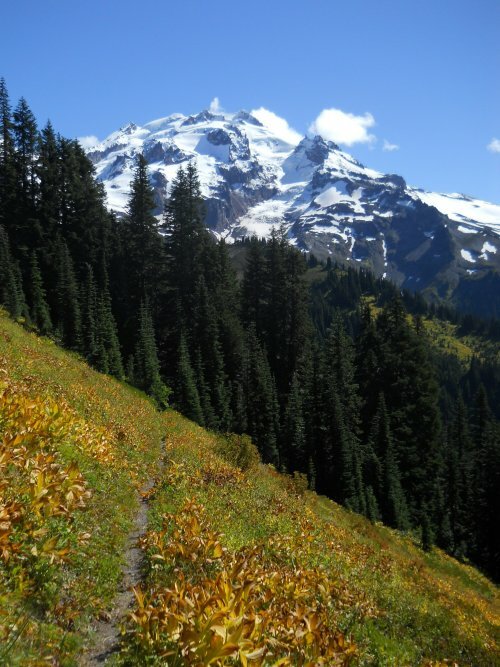 It's a great organization that's done wonderful work for the trails of Washington state. You might not live in Washington and think you don't benefit from it, but let me remind you--stories from the trail only happen because of organizations like this! 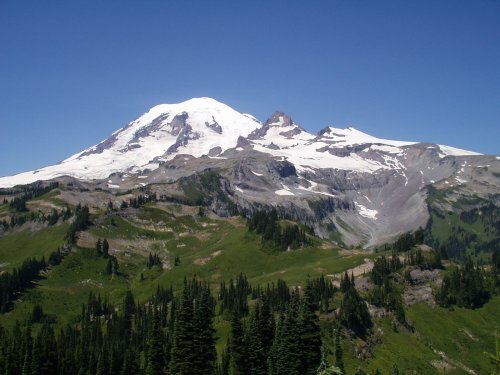 Or maybe you've read my blog and the adventures I've hiked in Washington state, or read about other people's accounts of their thru-hikes of the Pacific Crest Trail. Organizations like this make these trails possible. So please, even if you can only spare five or ten bucks, that's great! It may not sound like much, but it adds up! PS. To make sure you get your postcard, but sure to email me your address. The WTA will tell me who donated, but not your address! And if I know you by a trail name rather than your real name, I might have even more trouble figuring out where to send it! May 14: Between waking up late and the long drive back to the trail where Amanda had picked me up at the end of the day, I didn’t get back on the trail and walking until 10:00 in the morning—a late start by any measure! And, just because I like a challenge (I guess—I can’t imagine why else I’d have done it to myself), I was going to do a whopping 20.0 miles for the day. That many miles isn’t so bad, but it was a late start for such a high-mileage day. how people get themselves buried in a national park?! And almost first thing I did was detour off the Appalachian Trail. The A.T. led through Big Meadow, which is nice and all, but a largely parallel, blue-blazed trail led down to Lewis Falls and I decided it would be more fun to see a waterfall. The detour wasn’t a shortcut, however. Oh, no… The detour went down a steeper, longer and rockier trail than the A.T. did. The A.T. followed a nearly flat ridgeline and the shortest path over the ridge while I meandered well off the ridge then would have to reclimb it to get back to the top. And I have to say, for anyone reading this and wants to know my opinion of which route to take, I’d stay on the official A.T. The waterfall I thought was underwhelming for the amount of effort required to get there. On the way down, I filled up a water bottle from a stream—not unusual for me to do—but further down the trail it crossed the stream again and there had been posts installed warning that the water was contaminated and not to drink it. Damn it! It probably came straight from the Big Meadow area. You’d think in a national park the water would be safe to drink, but civilization does terrible things to water. I hadn’t actually drank any of the water yet. It was early in the morning and I wasn’t thirsty—I was just filling up for later—but I didn’t dump out the water upon learning that it was contaminated. I wasn’t sure where the next water source would be and contaminated water was better than no water at all if push came to shove! I wouldn’t drink any of the water—not yet, at least—but I wasn’t going to dump it out until I found a better replacement. It didn’t take long for me to rejoin the A.T. near the Big Meadow Campground where I was able to dump out the contaminated water and fill up with piped water from the campground. Don’t drink water when you find a message like this marking it! Once again, Amanda and I moved our base of operations since the drive from our last hotel was becoming prohibitively long and from Thornton’s Pass, the town of Luray was a very quick drive down the road. We found ourselves a cheap hotel and ate dinner at a nearby Italian restaurant for the night. Lewis Falls—kind of a letdown for me. I’ve seen much bigger and more impressive falls. And ones that didn’t use a lot of contaminated water from Big Meadows! Lots of big views today, though! Watch out for that “stomach bug”! It’s a nasty little critter! You can take horse rides in the Shenandoahs. This is one of the horses at a stable that the trail passes by. =) Hello little horsey! Luray—our destination for the night—is down there somewhere. I think I found our hotel! See the tiny people on the cliffs below? Day 65: Into the Shenandoahs! Day 64: And into Waynesboro! Day 61: Eight hundred miles done!